reduce the policy repo rate under the liquidity adjustment facility (LAF) by 25 basis points from 6.25 per cent to 6.0 per cent with immediate effect. 2. Since the June 2017 meeting of the MPC, impulses of growth have spread across the global economy albeit still lacking the strength of a self-sustaining recovery. Among the advanced economies (AEs), the US has expanded at a faster pace in Q2 after a weak Q1, supported by steadily improving labour market conditions, increasing consumer spending, upbeat consumer confidence helped by softer than expected inflation, and improving industrial production. Policy and political risks, however, continue to cloud the outlook. In the Euro area, the recovery has broadened across constituent economies on the back of falling unemployment and a pickup in private consumption; political uncertainty has receded substantially. In Japan, a modest but steady expansion has been taking hold, underpinned by strengthening exports, accelerating industrial production and wage reflation. 4. The modest firming up of global demand and stable commodity prices have supported global trade volumes, reflected in rising exports and imports in key economies. In the second half of July, crude prices have risen modestly out of bearish territory on account of inventory drawdown in the US, but the supply overhang persists. Chinese demand has fuelled a recent rally in metal prices, particularly copper. Bullion prices fell to multi-month lows on improved risk appetite but remain vulnerable to shifts in the geopolitical environment. Notwithstanding these developments, inflation is well below target in most AEs and is subdued across most EMEs. 5. International financial markets have been resilient to political uncertainties and volatility has declined, except for sporadic reactions to hints of balance sheet adjustments by systemic central banks. Equity markets in most AEs have registered gains, with indices crossing previous highs in the US, but European markets were weighed down by Brexit talks and the strengthening euro. In EMEs, equities have gained on surging global risk appetite underpinned by improving macroeconomic fundamentals that have been pulling in capital inflows. Bond yields in major AEs have hardened on expectations of monetary policy normalisation, with German bunds reaching an intra-year high. In EMEs, the situation has remained diverse, driven by domestic factors, and fixed-income markets have been generally insulated from the bond sell-off in AEs. In the currency markets, the US dollar weakened further and fell to a multi-month low in July on weak inflation and uncertainty around the policies of the US administration. The euro, which has remained bullish, rallied further on upbeat economic data. The Japanese yen has generally eased, interspersed by bouts of appreciation on safe haven demand. EME currencies largely remained stable and have traded with an appreciating bias. 6. On the domestic front, a normal and well-distributed south-west monsoon for the second consecutive year has brightened the prospects of agricultural and allied activities and rural demand. By August 1, rainfall was 1 per cent above the long period average (LPA) and 84 per cent of the country’s geographical area received excess to normal precipitation. Kharif sowing has progressed at a pace higher than last year’s, with full-season sowing nearly complete for sugarcane, jute and soybean. The initial uncertainty surrounding sowing of pulses barring tur and rice in some regions has also largely dissipated. Sowing of cotton and coarse cereals has exceeded last year’s levels but for oilseeds, it is lagging. Overall, these developments should help achieve the crop production targets for 2017-18 set by the Ministry of Agriculture at a higher level than the peak attained in the previous year. Meanwhile, procurement operations in respect of rice and wheat during the rabi marketing season have been stepped up to record levels – 36.1 million tonnes in April-June 2017 – and stocks have risen to 1.5 times the buffer norm for the quarter ending September. 8. In contrast to manufacturing, high frequency real indicators of services sector activity point to a mixed picture in Q1. In the transportation sub-sector, freight carriage by air registered a strong performance sequentially and on an annual basis. Commercial vehicle sales rose after two successive months of contraction in response to the Bharat Standard (BS)-IV emission compliance switchover. Sales of passenger cars and two-wheelers suffered temporary dislocation in June even as motorcycle sales continued to grow for the third consecutive month, reflecting the firmness of rural demand. Activity in the communication sub-sector accelerated in May on strong and sustained growth in the subscriber base of voice and data services. The hospitality sub-sector was supported by vigorous growth of foreign tourist arrivals and air passenger traffic. The acceleration in steel consumption in April-May may be a precursor to a pickup in construction activity in Q1, but cement production remains in contraction mode. The PMI for the services sector continued to remain in expansion mode in May-June on expectations of improvement in market conditions. 9. In June, retail inflation measured by year-on-year changes in the CPI plunged to its lowest reading in the series based to 2011-12. This was mainly the outcome of large favourable base effects which are slated to dissipate and reverse from August. Although month-on-month increases in the price level have been picking up since April, they were weak in relation to the typical food-price driven summer uptick. The delay in indirect tax revisions and anecdotal evidence of clearance sales across commodities could have dampened the momentum. 10. Prices of food and beverages, which went into deflation in May 2017 for the first time in the new CPI series, sank further in June as prices of pulses, vegetables, spices and eggs recorded year-on-year declines and inflation moderated across most other sub-groups. There are now visible signs, however, of the usual seasonal price spikes, even if with a delay and especially in respect of tomatoes, onions and milk. 13. Surplus liquidity conditions persisted in the system, exacerbated by front-loading of budgetary spending by the Government. There was also some moderation in the pace of increase in currency in circulation (CiC) which is typical at this time of the year – as against the increase of ₹ 1.5 trillion in CiC during the first two months of 2017-18, it was ₹ 436 billion and ₹ 95 billon during June and July, respectively. Normally, currency returns to the banking system in these months and is reflected in a decline in CiC; consequently, the increase in CiC recorded this year reflects the sustained pace of remonetisation and the associated absorption of liquidity from the system. Surplus liquidity of ₹ 1 trillion was absorbed through issuance of treasury bills (TBs) under the market stabilisation scheme (MSS) and ₹ 1.3 trillion through cash management bills (CMBs) on a cumulative basis so far this financial year. Enduring surplus conditions warranted outright open market sales of ₹ 100 billion each on two occasions in June and July. Another auction of an equivalent amount has been announced and will be conducted on August 10, 2017. Apart from these operations, net average absorption of liquidity under the LAF was at ₹ 3.1 trillion in June and ₹ 3.0 trillion in July. Reflecting this active liquidity management, the weighted average call rate (WACR) firmed up and traded about 17 bps below the repo rate on average during June and July – down from 29-32 basis points (bps) in March-April and 21 bps in May – within the LAF corridor. 15. The second bi-monthly statement projected quarterly average headline inflation in the range of 2.0-3.5 per cent in the first half of the year and 3.5-4.5 per cent in the second half. The actual outcome for Q1 has tracked projections. Looking ahead, as base effects fade, the evolving momentum of inflation would be determined by (a) the impact on the CPI of the implementation of house rent allowances (HRA) under the 7th central pay commission (CPC); (b) the impact of the price revisions withheld ahead of the GST; and (c) the disentangling of the structural and transitory factors shaping food inflation. The inflation trajectory has been updated taking into account all these factors and incorporates the first round impact of the implementation of the HRA award by the Centre (Chart 1). 16. There are several factors contributing to uncertainty around this baseline inflation trajectory. Implementation of farm loan waivers by States may result in possible fiscal slippages and undermine the quality of public spending, entailing inflationary spillovers. Moreover, the timing of the States’ implementation of the salary and allowances award is critical – it is not factored into the baseline projection in view of lack of information on their plans. If States choose to implement salary and allowance increases similar to the Centre in the current financial year, headline inflation could rise by an additional estimated 100 basis points above the baseline over 18-24 months. Also, high frequency indicators suggest that price pressures are building up in vegetables and animal proteins in the near months. There are, however, some moderating forces at work. First, the second successive normal monsoon coupled with effective supply management measures may keep food inflation under check. Second, if the general moderation of price increases in CPI excluding food and fuel continues, it will contain upside pressures on headline inflation. Third, the international commodity price outlook is fairly stable at the current juncture. 17. Business sentiment polled in the manufacturing sector reflects expectations of moderation of activity in Q2 of 2017-18 from the preceding quarter. Moreover, high levels of stress in twin balance sheets – banks and corporations – are likely to deter new investment. With the real estate sector coming under the regulatory umbrella, new project launches may involve extended gestations and, along with the anticipated consolidation in the sector, may restrain growth, with spillovers to construction and ancillary activities. Also, given the limits on raising market borrowings and taxes by States, farm loan waivers are likely to compel a cutback on capital expenditure, with adverse implications for the already damped capex cycle. At the same time, upsides to the baseline projections emanate from the rising probability of another good kharif harvest, the boost to rural demand from the higher budgetary allocation to housing in rural areas, the significant step-up in the budgetary allocation for roads and bridges, and the growth-enhancing effects of the GST, viz., the shifting of trade from unorganised to organised segments; the reduction of tax cascades; cost, efficiency and competitiveness gains; and synergies in domestic supply chains. In turn, these virtuous forces may spur investment. External demand conditions are gradually improving and should support the domestic economy, although global political risks remain significant. 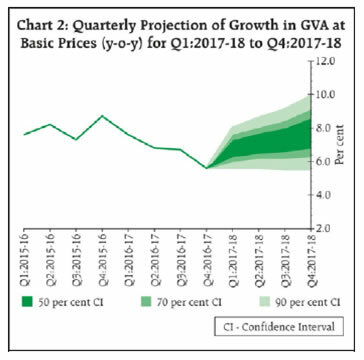 Keeping in view these factors, the projection of real GVA growth for 2017-18 has been retained at the June 2017 projection of 7.3 per cent, with risks evenly balanced (Chart 2). 18. The MPC observed that while inflation has fallen to a historic low, a conclusive segregation of transitory and structural factors driving the disinflation is still elusive. In respect of inflation-sensitive vegetables, prices are recording spikes. Excess supply conditions continue to push down prices of pulses and keep those of cereals in check. The MPC will continue monitoring movements in inflation to ascertain if recent soft readings are transient or if a more durable disinflation is underway. In its assessment of real activity, the MPC noted that while the outlook for agriculture appears robust, underlying growth impulses in industry and services are weakening, given corporate deleveraging and the retrenchment of investment demand. 19. The MPC noted that some of the upside risks to inflation have either reduced or not materialised - (i) the baseline path of headline inflation excluding the HRA impact has fallen below the projection made in June to a little above 4 per cent by Q4; (ii) inflation excluding food and fuel has fallen significantly over the past three months; and, (iii) the roll-out of the GST has been smooth and the monsoon normal. Consequently, some space has opened up for monetary policy accommodation, given the dynamics of the output gap. Accordingly, the MPC decided to reduce the policy repo rate by 25 basis points. 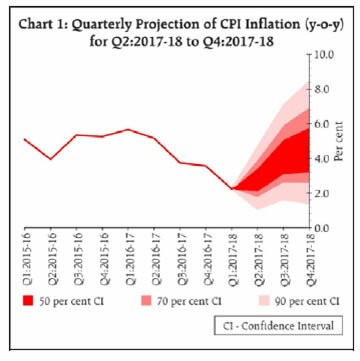 Noting, however, that the trajectory of inflation in the baseline projection is expected to rise from current lows, the MPC decided to keep the policy stance neutral and to watch incoming data. The MPC remains focused on its commitment to keeping headline inflation close to 4 per cent on a durable basis. 20. On the state of the economy, the MPC is of the view that there is an urgent need to reinvigorate private investment, remove infrastructure bottlenecks and provide a major thrust to the Pradhan Mantri Awas Yojana for housing needs of all. This hinges on speedier clearance of projects by the States. On their part, the Government and the Reserve Bank are working in close coordination to resolve large stressed corporate borrowers and recapitalise public sector banks within the fiscal deficit target. These efforts should help restart credit flows to the productive sectors as demand revives. 21. Dr. Chetan Ghate, Dr. Pami Dua, Dr. Viral V. Acharya and Dr. Urjit R. Patel were in favour of the monetary policy decision, while Dr. Ravindra H. Dholakia voted for a policy rate reduction of 50 basis points and Dr. Michael Debabrata Patra voted for status quo. The minutes of the MPC’s meeting will be published by August 16, 2017.